SPOT Gen3 gives you a critical, life-saving line of communication when you travel beyond the boundaries of mobile service. The latest generation of award-winning SPOT devices, SPOT Gen3 lets family and friends know you’re okay, or if the worst should happen, sends emergency responders your GPS location – all with the push of a button. Add this rugged, pocket-sized device to your essential gear and stay connected whenever you roam. Custom Tracking Rate – SPOT Gen3′s customized tracking allows you to change the rate that tracks are sent from 2 1/2, 5, 10, 30 or 60 minutes when you upgrade to one of the new tracking services: Unlimited or Extreme Tracking. 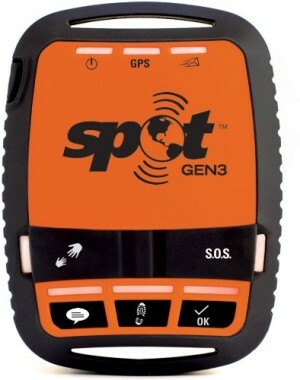 Motion-Activated Tracking – A vibration sensor tells SPOT to send your GPS location when you are moving, conserving battery power and avoids sending duplicate tracks. A new feature is Dock Mode which is designed for asset monitoring of a vessel that is primarily stored on the water. Dock Mode changes the way the SPOT determines new movement from a vibration sensor, embedded within the unit, to accommodate constant movement of a vessel on the water when moored or at anchor. NOTE : Requires additional purchase of annual subscription.